With about $5 worth of felt and a couple of items you probably have in your home, we can make versatile, simple terrain for your battlefield! Click on through to learn how. Now that we’ve spent some time talking about what exactly defines terrain, let’s take a look at perhaps the easiest way to stock up on terrain of your own: cheap, flexible area terrain. Area terrain is unique in that it represents a zone of terrain, rather than individual objects or pieces of terrain. When determining the size of area terrain, imagine a zone beginning at the bottom edges of the terrain and extending straight upward to a point parallel with the highest physical feature of the terrain. This creates a three dimensional, often cylindrical, zone that is effected by the area terrain. Any attacks made that fire through or into this zone, even if line of sight is not physically blocked by a feature of this terrain, are subject to the effects of the area terrain. It is easy to determine the boundaries of area terrain if it is mounted on a base of its own, dotted with decorative terrain elements (such as trees) that can be removed to accommodate the movement and placement of minis. Some battlefields are more complex and this type of terrain is built into the battlefield itself. If players wish to delineate an area of terrain that does not have a clear boundary, they may choose a number of terrain pieces and draw an imaginary line around the outer geometry of those pieces to determine the outer edges of the terrain. As we discussed previously, perhaps the biggest part of figuring out terrain in Legion comes down to a simple agreement with your opponent, meaning that just about anything can be terrain if you use your imagination. With that in mind, let’s take a look at three examples of the absolute cheapest terrain I can think of. We’ll keep things at the casual level, instead of competitive, so that we can be a bit more lenient with our rules. 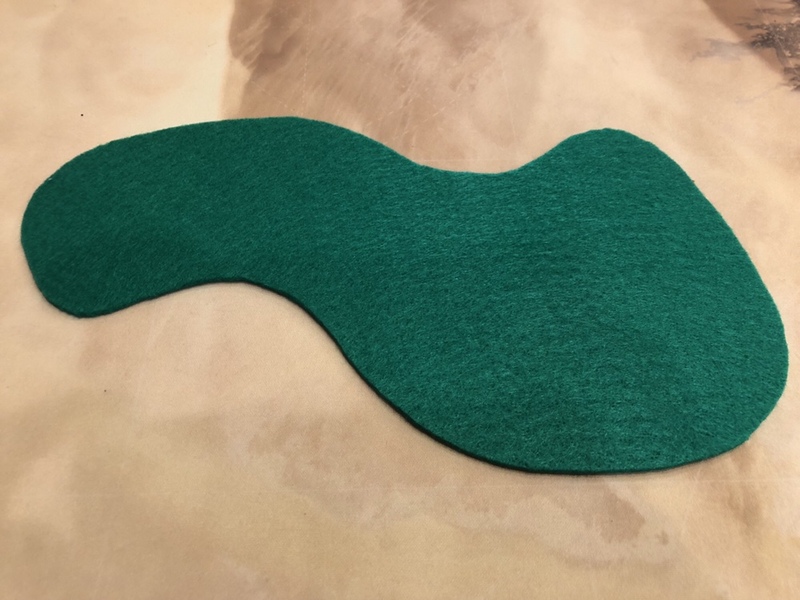 Using a swath of cheap, green felt, I cut out a random pattern with weird divots and curves, enough to give us plenty of coverage and to be reasonably interesting to look at. And that’s it. Using our mind’s eye, we can imagine it as the canopy of a beautiful forest! Now let’s say we want to include a similar type of terrain, but mix it up a bit. 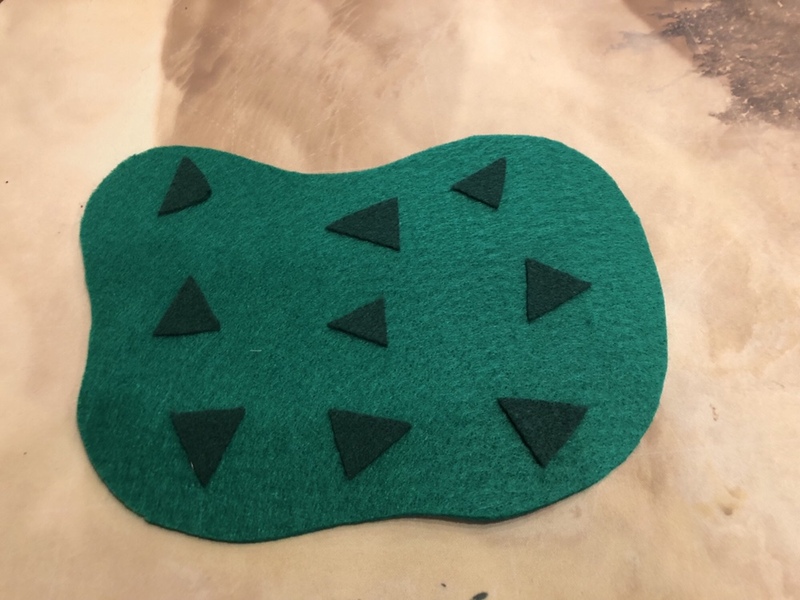 We take the same type of green felt, and add a few dark green triangles to it to represent trees, signifying this as dense forest. We’ll say that the dense forest is so dense that it acts like a wall and totally obstructs line of sight as long as a mini’s base is completely on the felt. If any part of a mini’s base is off the felt, it can be seen (given that the dense forest or other L.O.S.-obstructing terrain are not between the enemy mini and your mini). Furthermore, it’s so dense that vehicles of any type cannot pass through it. Only troopers are allowed to move through. Finally, we’ll get some nice light blue felt and cut it into two winding strips to make a simple river, exactly three feet long so that it goes from one long edge of the board to the other, creating a natural boundary. And to help the troopers out, we’ll place a small index card across one or two points in the river to indicate a safe bridge over which they can pass. And just like that, for a total of about $5, we’ve got three flexible, easy-to-transport pieces of terrain for our next tabletop adventure. The possibilities with area terrain are limited only by your imagination, and what it lacks in visuals it makes up for in sheer utility. Thanks for the ideas! I barely have time to play, much less spend hours making terrain tables. Spent $6 and 30 minutes today and made enough terrain to feel like I have enough to play.